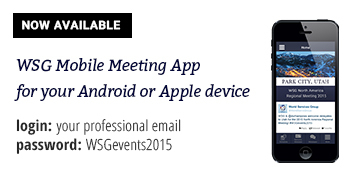 The 2015 WSG North American Meeting was hosted by Durham Jones & Pinegar in Park City, Utah, USA on March 12-13, 2015. The meeting consisted of guest speakers, keynote presentations, and current case studies. There were be several opportunities to connect and network among the WSG North American members. WSG members interested in gaining valuable industry information, strengthening their business relationships, and increasing business opportunities within the organization in the North American region. Meeting attire is business professional.